There is nothing worse than showing up for an on-site visit without the correct cable you need for a job. So what is a network admin to do, carry around several bulky cables everywhere? For quite some time I've been carrying a single CAT5 ethernet cable in my laptop bag along with "the world's shortest crossover cable" and an RJ45 coupler. This allows me to turn my ethernet cable into a crossover cable and eliminates the need to carry around a second lengthy cable. Handy, but nothing to write home about. More recently I have been working with a lot of network devices with serial console ports, including Cisco routers and various other things. This means lugging around a null modem cable in addition to the non-standard RJ-45 to DB-9 console cable required by most Cisco equipment. But after putting together four simple custom adapters, I now have an ethernet cable, a crossover ethernet cable, a modem cable, a null modem cable, and a Cisco console cable all by carrying around just one standard ethernet cable. An added benefit is that I can always extend my cable by finding a longer ethernet cable than the one I carry in my bag. It is usually pretty easy to locate a long ethernet cable but not so easy to locate a long null modem cable. Do you find yourself toting several of these cables everywhere you go? Do you often wish you had brought a different cable with you after you have arrived on-site? Are you as geeky as me and think that this is just plain cool even if you never expect to configure a router in your lifetime? Then you need the 5-in-1 network admin's cable! These are the kind which you can pin however you want. Plus have a few extras on hand unless you are much more dextrous than me. Ditto on the extras just in case. You can cut up existing cables. The coupler must have all eight conductors. 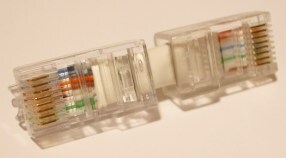 Be aware that many ethernet couplers, such as the one shown here, only have four. It must be an eight conductor cable, not a four conductor cable. 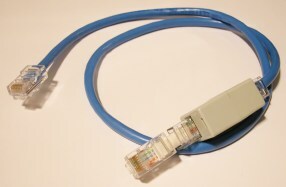 Make "the world's shortest crossover cable"
Note that this cable must cross the pairs that are not used by ethernet in addition to the pairs that are. This is why you must perform this critical step and cannot use a standard crossover cable you may already own. This is the most common order for ethernet cables, so you could get a head start by snipping off the end of an existing cable and then you only have to do the other end. If you are as geeky as me, you'll make sure that each pair has at least one twist. Then you can prove people wrong if they scoff, "That's not the world's shortest crossover cable, that's just an adapter!" 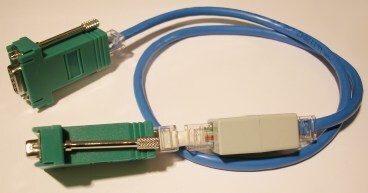 This adapter works with the RJ45 serial port found on most Cisco routers. It also works on some Sun servers. It is important to note that this is not a symmetric adapter. The 568B end will point away from the router and the other end will be inserted into the router. I marked the router end of mine with a sharpie so I wouldn't forget. Cisco's (otherwise very helpful) cabling page has RTS and CTS reversed on the DB9/RJ45 console cable, which I verified by inspecting an actual Cisco cable. They don't really care anyway because their console ports do not use flow control, but doing it the right way enables interoperability with Sun servers and perhaps some other things. * My DB9F/RJ45F modular adapters are colored blue, orange, black, red, green, yellow, brown, white (RJ45 1-8), but yours may not be. If yours are different, ignore the colors in the above pinout. DB9 pin 5 needs two wires connected to it. Snip the pins off of the wires coming from RJ45 pins 2 and 6 (orange and yellow on mine), strip about 3 mm off the end of each, and crimp them together onto one of your spare pins. 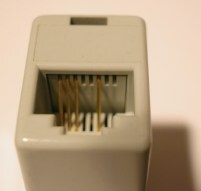 RJ45 pin 8 has to connect to both 1 and 6 on the DB9 connector. Snip the pin off of the white wire, strip the end, cut about an inch of scrap CAT5 and pull out two of the white wires, strip both ends off of them, crimp a pin on each one, and splice all three loose ends together. 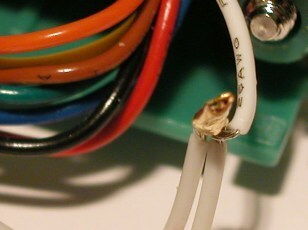 You can break the end off of a spare pin and use it to crimp the three wires together. You can use the other two white wires from the inch of CAT5 for the second adapter. Both of the DB9/RJ45 adapters should be wired exactly the same way, regardless of whether they will be used for DTE or DCE devices. Remember that the Cisco adapter is not reversible. This solution is somewhat similar to the Yost wiring standard which I have long found to be quite useful. The only reason that I did not use the Yost standard for my DB9/RJ45 adapters is that I wanted mine to work with any standard ethernet cable. I didn't use Cisco's pinout for the same reason. Plus, Cisco generally irritates me. I wanted the serial Transmit and Receive conductors each twisted with ground rather than with each other, which should cut down on cross-talk and allow longer cable lengths. 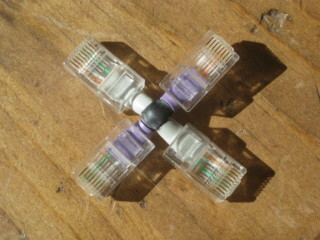 (I also think it is nifty to be able to use the same crossover cable for both ethernet and serial.) I haven't done any length or reliability testing, but so far everything I have tried has worked just fine. If you need a DB9/RJ45 serial cable with different pinouts than the Cisco one, all you have to do is make another little CAT5 adapter. Cable ends are cheap and plentiful. 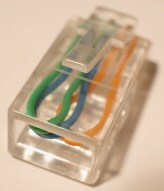 When used as a serial cable, this is a hardware flow control (CTS/RTS) cable. If you are using devices which both require hardware flow control, it should work. If neither of your devices require hardware flow control, it should still work. However, if one of your devices requires hardware flow control and the other does not support hardware flow control, then you need a cable that fakes flow control. This could be done with an additional DB9/RJ45 adapter or with another CAT5 adapter and some creative crimping (my preference), both of which are left as exercises for the reader. If you grab a random ethernet cable to use with your serial adapters, remember to make sure that it has all eight conductors. 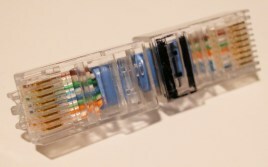 Also keep in mind that most ethernet cables have only been tested for connectivity on four conductors (1, 2, 3, and 6) if they have been tested at all. I used those conductors for the most important serial signals (Transmit, Receive, and Ground) just in case, but some serial devices won't talk without all eight working. Many additional adapters could easily be added to this set. A few that leap to mind would be for other kinds of serial ports such as DB-25 and various DIN and miniDIN ports for Macintoshes and other things. If you come up with a useful one, send me the pinout (as well as a link to an authoritative source regarding your device's pinout if possible) and I will post it here. 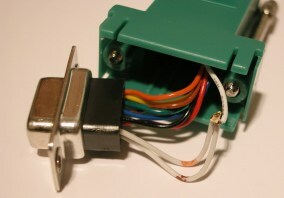 The photograph depicts a three-wire RS-232 loopback plug, not the four wire combination plug. A handy use for this plug is to perform rudimentary cable testing. 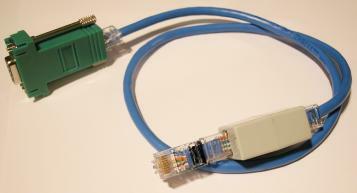 To test an ethernet cable, for example, you can attach the loopback plug to one end of the cable with your coupler. Then plug the other end of the cable into an ethernet port and see if you get link. If you plug it into a Windows 2000 or XP box, it will notify you if there is link. With Linux you can use mii-tool or mii-diag. This works for both straight-through and crossover cables. 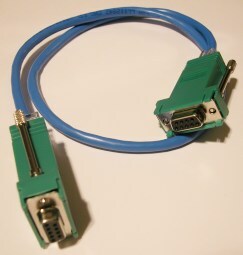 This cable provides loopback link (just like the loopback adapter) to a hub or other device while allowing a sniffer on the other end with 100% assurance that no return traffic will be transmitted. This follows the "Model B" design as described in Receive-only UTP cables and Network Taps. You can buy a clunky box for $100 or more that does nothing more than this simple and ultra-portable network tap. 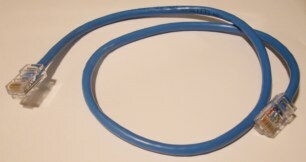 Just use a coupler to insert the tap in-line on the end of an existing ethernet cable carrying the traffic that interests you, and then you can sniff one direction of traffic from one of the sniffer ends or the other direction of traffic from the other sniffer end. You'll need an extra coupler or two for this. Like the sniffer cable above, the throwing star LAN tap provides receive-only sniffing, guaranteed to not interfere with network traffic. This is great for inserting into crossover cable connections, such as a link between a firewall and a router. This follows the basic design described in Receive-only UTP cables and Network Taps. Some of the commercial alternatives have nice additional features but none is more portable. See my blog for an even better version. If you like the throwing star LAN tap, you'll love the Ethernet and RS-232 tap. Exercise for the reader: adapt this design to the throwing star form factor. If all you ever use is an ethernet cable, everything starts to look like an RJ45 jack. Text and diagrams copyright 2004-2011 Michael Ossmann, http://www.ossmann.com/mike/. Most of the photos are copyright 2004 Dan Gottesman, http://dangottesman.com/. This work is licensed under a Creative Commons License. Please include the URL http://www.ossmann.com/5-in-1.html when giving credit to the authors.